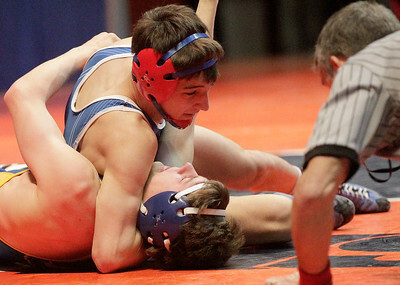 Matthew Apgar - mapgar@shawmedia.com Anthony Cheloni of Marmion puts Tyler Zeman of Lyons onto his back during their IHSA class 3A state championship 132 pound third place semifinal bout on Saturday, Feb. 20, 2016 at the University of Illinois at Urbana–Champaign's State Farm Center in Champaign. 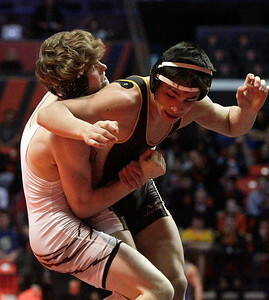 Matthew Apgar - mapgar@shawmedia.com George Strang of Kaneland, left, grapples with Wylie Allen of Hampshire during their IHSA class 2A state championship 152 pound third place semifinal match on Saturday, Feb. 20, 2016 at the University of Illinois at Urbana–Champaign's State Farm Center in Champaign. 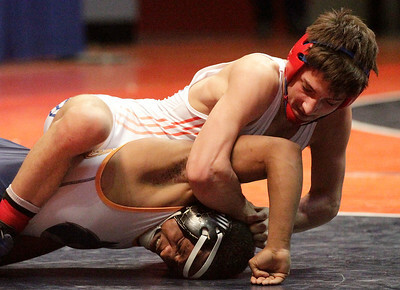 Strang lost to take fourth place. Matthew Apgar - mapgar@shawmedia.com Michael Petersen of Crystal Lake Central wrestles with Demarius Smith of Rantoul in their 145 pound class 2A third place bout in the IHSA state championship tournament on Saturday, Feb. 20, 2016 at the University of Illinois at Urbana–Champaign's State Farm Center in Champaign. 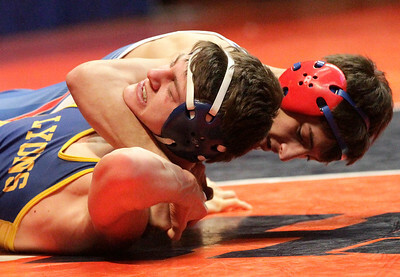 Matthew Apgar - mapgar@shawmedia.com Kevin Zange of Woodstock tries to break the grasp on him held by Cameron Lopez of Mount Carmel in their 160 pound IHSA class 2A state championship tournament bout on Saturday, Feb. 20, 2016 at the University of Illinois at Urbana–Champaign's State Farm Center in Champaign. 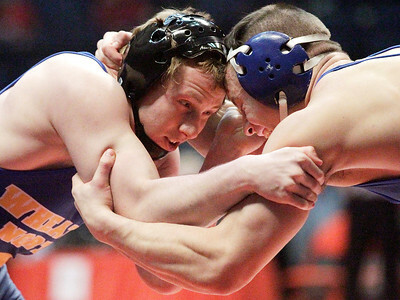 Matthew Apgar - mapgar@shawmedia.com Devin Donovan of Wheaton North, left, grapples with Ben Schneider of Sandburg in their class 3A 160 pound bout during the IHSA state championship tournament on Saturday, Feb. 20, 2016 at the University of Illinois at Urbana–Champaign's State Farm Center in Champaign. 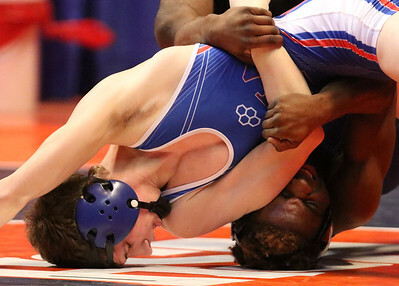 Matthew Apgar - mapgar@shawmedia.com Tyree Johnson of Downers Grove, right, wrestles with Brad Gross of Marmion during the IHSA class 3A 145 pound third place state championship semifinals on Saturday, Feb. 20, 2016 at the University of Illinois at Urbana–Champaign's State Farm Center in Champaign. Matthew Apgar - mapgar@shawmedia.com Tyree Johnson of Downers Grove, top, flips over Brad Gross of Marmion during the IHSA class 3A 145 pound third place state championship semifinals on Saturday, Feb. 20, 2016 at the University of Illinois at Urbana–Champaign's State Farm Center in Champaign. 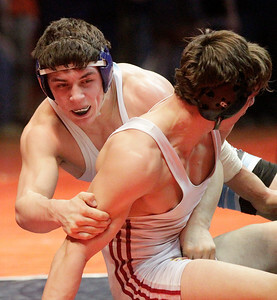 Matthew Apgar - mapgar@shawmedia.com Marmion's Anthony Cheloni, top, drives Gabriel Townsell of Oak Park River Forest into the mat during their 132 pound class 3A IHSA state championship third place match on Saturday, Feb. 20, 2016 at the University of Illinois at Urbana–Champaign's State Farm Center in Champaign. 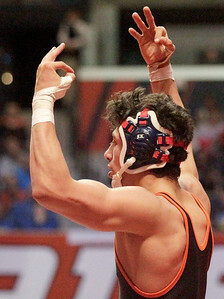 Matthew Apgar - mapgar@shawmedia.com Michael Petersen of Crystal Lake Central celebrates his 145 pound class 2A third place win in the IHSA state championship tournament on Saturday, Feb. 20, 2016 at the University of Illinois at Urbana–Champaign's State Farm Center in Champaign. 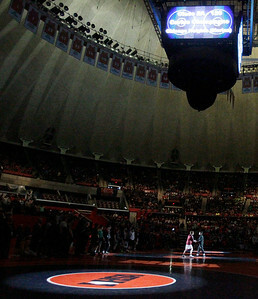 Matthew Apgar - mapgar@shawmedia.com Charles Faber of Glenbard West, top, takes control of Joe Arroyo of Grays Lake North during their IHSA class 3A state championship 5th place bout on Saturday, Feb. 20, 2016 at the University of Illinois at Urbana–Champaign's State Farm Center in Champaign. Matthew Apgar - mapgar@shawmedia.com Wylie Allen of Hampshire, top, puts Pontiac's Kevin Gschwendtner onto the mat during their 152 pound third place bout in the IHSA class 2A state championship tournament on Saturday, Feb. 20, 2016 at the University of Illinois at Urbana–Champaign's State Farm Center in Champaign. 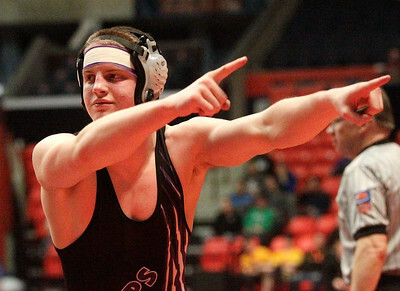 Matthew Apgar - mapgar@shawmedia.com Wylie Allen of Hampshire celebrates his 152 pound third place bout in the IHSA class 2A state championship tournament on Saturday, Feb. 20, 2016 at the University of Illinois at Urbana–Champaign's State Farm Center in Champaign. Matthew Apgar - mapgar@shawmedia.com Wylie Allen of Hampshire hugs his coach after winning his 152 pound third place bout in the IHSA class 2A state championship tournament on Saturday, Feb. 20, 2016 at the University of Illinois at Urbana–Champaign's State Farm Center in Champaign. Matthew Apgar - mapgar@shawmedia.com Willowbrook's Jack Jessen, left, takes control of Schaumberg's Tony Vezzetti during their IHSA class 3A 182 pound third place state championship bout on Saturday, Feb. 20, 2016 at the University of Illinois at Urbana–Champaign's State Farm Center in Champaign. Matthew Apgar - mapgar@shawmedia.com Willowbrook's Jack Jessen, bottom, takes control of Schaumberg's Tony Vezzetti during their IHSA class 3A 182 pound third place state championship bout on Saturday, Feb. 20, 2016 at the University of Illinois at Urbana–Champaign's State Farm Center in Champaign. 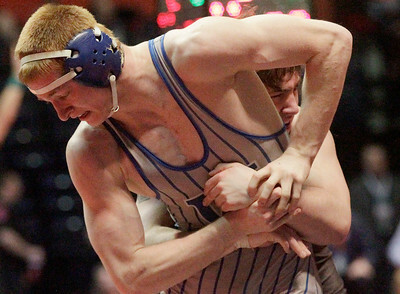 Matthew Apgar - mapgar@shawmedia.com Kevin Zange of Woodstock, right, tries to break the grasp on him held by Urbana's Felix Imbanga in their 160 pound IHSA class 2A state championship tournament bout on Saturday, Feb. 20, 2016 at the University of Illinois at Urbana–Champaign's State Farm Center in Champaign. 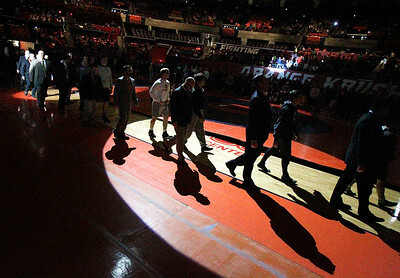 Matthew Apgar - mapgar@shawmedia.com IHSA state championship finalists are paraded around the mat during the grand march on Saturday, Feb. 20, 2016 at the University of Illinois at Urbana–Champaign's State Farm Center in Champaign. Matthew Apgar - mapgar@shawmedia.com Travis Piotrowski of Prairie Ridge, left, shakes hands with his 126 pound adversary, Carlos Champagne, as they are introduced at the beginning of the finals round in the IHSA state championship tournament on Saturday, Feb. 20, 2016 at the University of Illinois at Urbana–Champaign's State Farm Center in Champaign. 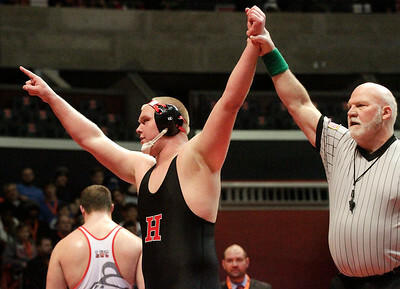 Matthew Apgar - mapgar@shawmedia.com Matt Allen of Hinsdale Central celebrates his Class 3A 285 pound finals bout against Bryan Ditchman of Lincoln-Way Central during the IHSA state championship tournament on Saturday, Feb. 20, 2016 at the University of Illinois at Urbana–Champaign's State Farm Center in Champaign. 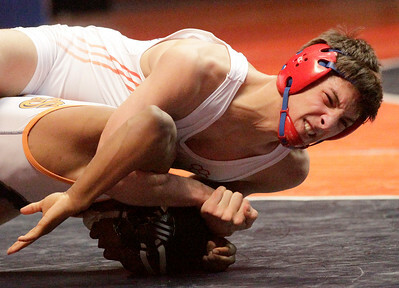 Matthew Apgar - mapgar@shawmedia.com Immaculate Conception's Joe Bianchini, left, tries to escape the control of Tyler Fleetwood of Fulton in their IHSA class 1A 106 pound state championship final on Saturday, Feb. 20, 2016 at the University of Illinois at Urbana–Champaign's State Farm Center in Champaign. 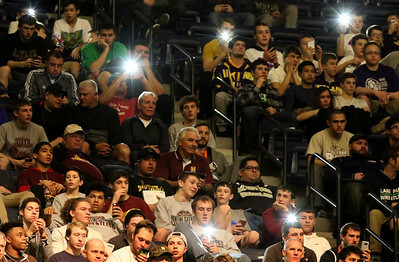 Matthew Apgar - mapgar@shawmedia.com Fans light up the stadium by taking photographs with their smartphones from the stands during the IHSA state championship tournament on Saturday, Feb. 20, 2016 at the University of Illinois at Urbana–Champaign's State Farm Center in Champaign. 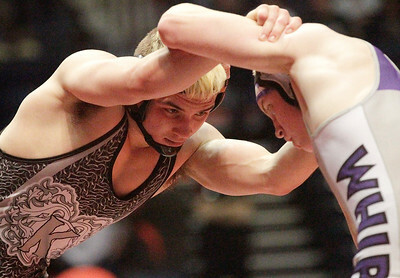 Matthew Apgar - mapgar@shawmedia.com Travis Piotrowski of Prairie Ridge, left, throws Carlos Champagne of Chicago Heights Marian during their IHSA class 2A 126 pound state championship final on Saturday, Feb. 20, 2016 at the University of Illinois at Urbana–Champaign's State Farm Center in Champaign. Matthew Apgar - mapgar@shawmedia.com Travis Piotrowski of Prairie Ridge, left, pins Carlos Champagne of Chicago Heights Marian during their IHSA class 2A 126 pound state championship final on Saturday, Feb. 20, 2016 at the University of Illinois at Urbana–Champaign's State Farm Center in Champaign. 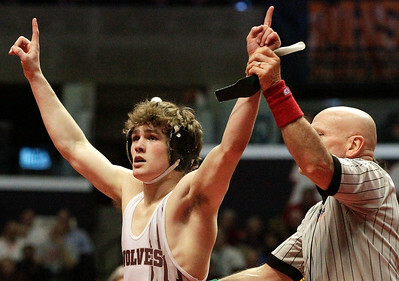 Matthew Apgar - mapgar@shawmedia.com Travis Piotrowski of Prairie Ridge celebrates his win over Carlos Champagne of Chicago Heights Marian during their IHSA class 2A 126 pound state championship final on Saturday, Feb. 20, 2016 at the University of Illinois at Urbana–Champaign's State Farm Center in Champaign. 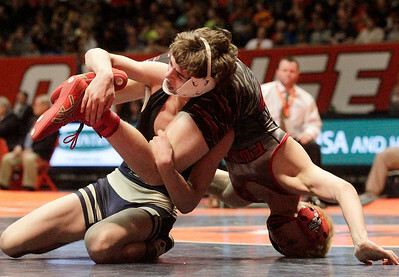 Matthew Apgar - mapgar@shawmedia.com Richmond-Burton's Gavin Sutton, left, picks up Lenny Petersen of Crystal Lake Central during their IHSA class 2A 138 pound state championship final on Saturday, Feb. 20, 2016 at the University of Illinois at Urbana–Champaign's State Farm Center in Champaign. Matthew Apgar - mapgar@shawmedia.com Lenny Petersen of Crystal Lake Central pins Richmond-Burton's Gavin Sutton during their IHSA class 2A 138 pound state championship final on Saturday, Feb. 20, 2016 at the University of Illinois at Urbana–Champaign's State Farm Center in Champaign. 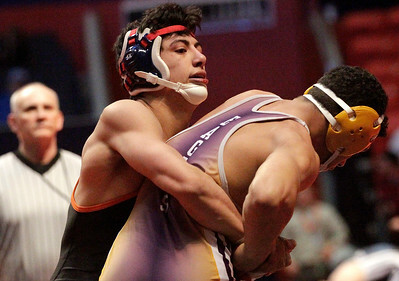 Kevin Zange of Woodstock tries to break the grasp on him held by Cameron Lopez of Mount Carmel in their 160 pound IHSA class 2A state championship tournament bout on Saturday, Feb. 20, 2016 at the University of Illinois at Urbana–Champaign's State Farm Center in Champaign.